There was a time when our oldest was quite young, maybe six or so, and a family friend was visiting, an eight-year-old boy named Forrest. We were driving somewhere around town in Minneapolis when M and I overheard Forrest in the back say to S, “Okay, now let’s pretend there’s a hot lava situation,” and M nearly drove off the road, it was so ridiculously cute. And ever since, M and I will say it to each other, “It’s a bit of a hot lava situation,” or a variation thereof. M said it again today on the road from St. Paul to Chicago. It was one of those moments when you’re driving along in cruise control in the right hand lane, slowly creeping up on the car in front of you, when you notice another car is edging up on you on the left. It’s a game of chicken in which someone has to capitulate, and you don’t want it be you, happily cruising along at your chosen speed. If you dawdle you’re going to have to brake and get stuck behind the slow car, but you’ve gone all soft lazing along in cruise control for the past 20 minutes and you don’t feel like speeding up and actually engaging with the other drivers. 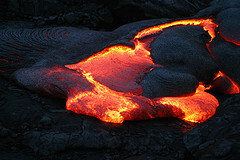 “Hot lava situation!” said M as he suddenly bolted into the left lane, and I knew just what he meant. I guess that’s what 18 years of marriage will do for you, let you build your own shorthand for life’s recurring events. This blog has become its own hot lava situation, I realize, as the year in which we lived in Berlin draws to a close. Better fish or cut bait, I keep telling myself, wondering what’s to become of this writing outlet. There was a nice order to it a moment ago, before I posted this one, in which all posts were dated from August 2013 to August 2014, neatly charting the course of our time away. And that’s pleasing in some sort of Montessori way, where everything has its place. The trouble is I’ve moved on from Berlin, but the months away still echo inside me, and there are plenty of essays waiting to pour out, they just don’t always get written down, or if they do, don’t get polished or posted. As you might have noticed. I guess I have a little less time to tend to them nowadays. There’s part of me that thinks I ought to shut down the whole enterprise, but there’s part of me that likes the historical record of our trip, not to mention the occasional folks who happen upon it, like rowers interested in musty wassersports museums, or more recently the strong man from the circus and his pals. But there’s another part of me that thinks I ought to put another log on the fire, ignore the fact that the name “Lost in Berlin” no longer pertains and just plod ahead. I’ve been coasting in cruise control for a few months now, back to my old habits of writing overwrought essays shared only with myself, and it’s become a little tiresome. “I miss your blog!” wrote a friend the other day, and driving between Madison and Chicago it hit me, I miss it too — miss the camaraderie, the comments back and forth, the parsing of life into chapters, serving them up one slice at a time, as if life could be wrestled into some sort of order. So maybe as 2014 draws to a close and 2015 yawns ahead, and having already snapped out of cruise control and ruined the symmetry of the blog with this very post, the seal has been broken and more stories will come. Today we played U2’s “Achtung Baby” to launch our road trip, as we always do, and tomorrow we’ll surely play the Flaming Lips, and when “Do You Realize” comes on I know where it will take me — back to that narrow Berlin kitchen in our five-room flat, lingering alone by the coffee pot as I so often did, gazing out at the linden tree in the courtyard and pining for home. Only now, having been reunited with home for a while, the ache for home is replaced with a sense of gratitude for having had it both ways. There are pictures I took in Berlin and never posted that belong nowhere but this blog, and little things that happened that I’m still trying to understand. If you’ll forgive my returning to old ground and mixing in some of what’s current, then just maybe I’ll manage to do it. Yay! I’ve missed your blog too. Thanks, MRM! Nice to hear your voice too. From time to time I have been wondering . . . Did she die? Did she move on? Has she gone pvt? And, in fact, I didn’t even see this post in my reader on my phone, but back on the tablet, here you are. Whatever you decide to do, don’t do it because of the name of your blog. It made perfect sense at the time. Some of us have names that NEVER made sense. Well, onomatopoeicbliss, I’m glad to hear your voice too, and that you found this blog. The advice about the blog name is especially apt coming from you. We’ll see what comes next. Welcome back! I’d love to hear about the girls and their transitions. Thanks, Bebe. I’ve been giving that some thought and will come up with something on the girls eventually. I am glad you are writing again for us. I love your blog and I have missed it. But I also understand that coming home and picking up work, temporarily makes you concentrate on other things. I hope, you will find time to write again. Thanks, Hanna! Happy New Year! I continue to write and will do my best to post some things too.